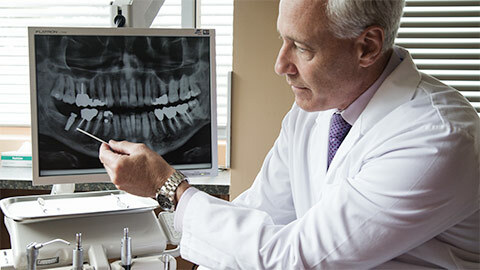 Did you know that if you lose a tooth, your jawbone can begin to deteriorate near the area where you lost your tooth? Dental implants offer a permanent solution for missing teeth, and they can help strengthen your jawbone, preventing bone loss. We offer Markham families secure and life-long foundations for replacement teeth with our dental implant services. Dental implants are replacement tooth roots made from a biocompatible material similar to the material used for artificial hips and knees. They function as supports for replacement teeth such as crowns, dentures or bridges. Most patients report that their dental implants have made a major difference in the appearance of their smiles, but many patients also say that implants have changed their lives! 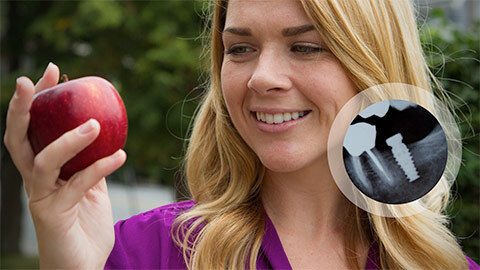 Dental implants have many benefits. With care, they can last a very long time. They are as strong as real teeth and restore your biting strength, allowing you to eat what you want. They maintain the structure of your jawbone, and reduce the chance of you developing bone atrophy in response to missing teeth. 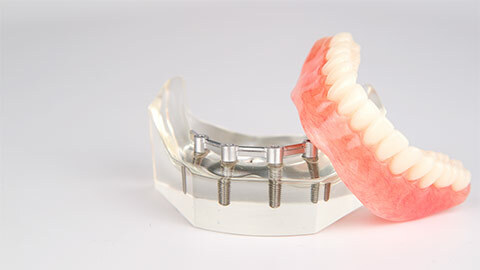 Implant-supported dentures have many advantages over traditional dentures; implant supported dentures don’t require adhesive or a plate, so they are more convenient and comfortable than traditional dentures. Call Markham Gate Dental Centre today to learn more about how implants can change your life for the better. Q: How long does it take to get an implant? A: Normally, the process to place an implant and attach a replacement tooth or denture takes three appointments over the course of several months. In the first appointment, the implants are surgically placed in your jawbone and then left for several months to integrate with your bone tissue. In the second appointment, we will attach a device called an abutment to your implant. The abutment is used to secure the replacement teeth to the implant. During the second appointment we will also take impressions of your teeth and gums that will be used to design the replacement teeth. In the third and final appointment we will attach the replacement teeth, check for fit and appearance, and the process is complete. Q: Am I too old to get implants? A: It depends on your bone tissue. As you age, you can lose bone tissue or your existing bone structure can grow weaker. When you come for an implant consultation we will examine the health of your jawbone to determine if it can support an implant. Q: Are dental implants covered by private health insurance? A: Your coverage will depend on your individual insurance plan. Our staff can assist you in understanding your plan and they can also help request a predetermination from your insurance company to see if you are covered.